Art Meets Fashion Runway Show from John Schell on Vimeo. Check out these team websites: AMF Evolution Transformed, AMF: Arts Collide, AMF: N-GOM, AMF: Reflections and Flow , AMF: Crossroads, AMF: Beauty’s Privilege, AMF: UME , AMF:Wired, AMF: La Femme Noir and AMF:Elavation . Confused? Print out this document with all the events listed on two pages. AMF Events and print out your map to all the events. Exclusive AMF Scarves by Valentine Viannay, and Rosemary KimBal are will be available to see at Mission Federal ArtWalk on April 30. Contact them to purchase at dancingbrush@cox.net. 760.943.7496 . Watch the wonderful video to see them being made. Lesson plans created by the teachers involved in the project will be posted and results featured in a special exhibition. Use coupon code amf2010 to get $20 off premium service. SDVAN is delighted to launch Art Meets Fashion in March 2010 with an estimated completion in the Spring of 2011.We are happy to partner with FOCUS to bring this collaboration to the SD Community. The exhibition will feature the results not only of the collaboration of the artist and fashion designer, but also the documentation of the process by talented videographers, writers and photographers. An exciting component of the team is the educator who will be asked to create lesson plans for their classrooms and general publication. Priority has been given to teachers who work with at risk teens. Our goal is to include teens within the teams when supervision by teachers can be provided. Print out this document with all the events listed on two pages. AMF Events and print out your map to all the events. The Gilded Cage at 5loaves 2fish: The Gilded Cage tells stories which explore the contrasts of elements like wild and tamed, tied and free, growth and restriction and interior and exterior using both painting and fashion. Reflections and Flow:The name Reflection and Flow emanates from swimming pool paintings, which explores the attributes of light reflected in and on moving water. Not only are patterns created but more deeply, a mystery about layers of coexisting universes. Fashions grab those concepts and dive deeply into them. Le Femme Noir at Dolcetti Boutique: Inspired by memories of Mozart’s Queen of the Night from The Magic Flute, La Femme Noir combines fantasy and the sci-fi world to create fashion changed into sculpture, textured and moving to create painting in the round. Beauty’s Privilege at Goga Boutique : The Beauty’s Privilege team is inspired to create works exploring loss and love then ultimately finding beauty in the midst of tragedy and adversity. This team is all about pure emotion and fantasy. UME at Glimpse Living : Ume (pronounced You-Me) celebrates and bridges cultures with a goal to bring us together. Motifs from Central America, Arabia, Asia are printed on everything from metal to chiffon to reinterpret, refine and redefine everything from clothing to household goods. Additional Contributor: Lynn Kebow (fashion consultant). Crossroads at Mosaic : Team Crossroads uses the beauty of wine known to stimulate and encourage conversation with its sensuality and enticing mystery to create clothing, accessories and visual art. They include the chemistry of producing the sensuous nectar to explore En Vino Veritas and the essence of truth in art. Goals: The teams will collaborate and mentor each other to gain new skills.These professional will have the opportunity to give back to the community through the mentoring process. The teachers will generate exciting lesson plans to take back to their students. The documenter records and displays the process as part of the education of the public. Note:It is possible that one person will play multiple roles – example: artist, may also be the teacher or the fashion designer may also act as the documenter. Exhibitions for each team would take place at a variety of galleries and boutiques (to coincide with the fashion show and organized ideally in clusters. We are pleased to announce that our lesson plans are now listed on the CARE website. (Collaborative Arts Resources for Education). It allows for many, many collaborations - we can call on designers, artists, galleries, boutiques, writers, event planners etc. We have many volunteers in these specialized areas. It has an educational component which is aimed at an under served teen age group. It will raise the bar for quality, challenge all involved to be creative and give confidence within the industry with a social celebration of the results. Applications due May 15 th 2010. PRESS and Past Events: Art Meets Fashion San Diego now has 129,000 listing on Google! Our thanks to Katherine Slauta, Director of Education, San Diego FIDM for providing this space for our information meeting. See facebooks photos of the meeting. Artists recycling fashion mannequin or making their own variations of a humanoid, bedecks, bedazzled and beckoning for your attention. 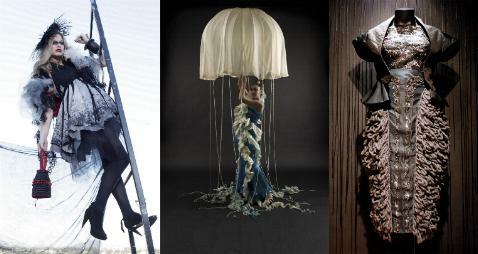 The Art Meets Fashion Mannequin Project, has create works of art from mannequin forms. One or more lucky mannequin might be showcased at the SD International Airport. Mannequin Manifesto and Medium is wide open. For more info: contact the co-chairs Ariane Brittany or Denise Bonaimo. Donations of mannequin blanks for this project are gratefully received. Thanks to .Marion Law for producing the Mannequin team song. Art Meets Fashion - The Fringe Events: please see the AMF: The Fringe Events calendar for full details. September 7 - October 3 with five spectacular designs created by Fashion Careers College students and graduates for this year's Art of Fashion. Free Admission. Body Art competition held by Aaron Brothers enter until Sept 25. The Real Life of Mannequins unveiled by French photographer Janine Free and French bricoleur d'images Guy Mayenobe at Gallery 21 in Spanish Village, Balboa Park starting Sept 29. Zandra Rhodes a Lifelong Love Affair with Textiles will open at the Mingei International Museum in Balboa Park on Oct 3, 2010 to April, 2011. Recycled Materials Fashion Runway Show at Escondido Art Partnership Municipal Gallery on Sat Oct 23, VIP $35 from 5:30, show $20 at 7:30. Tagged - Nov 13, 7 to 10 pm at Mosaic Gallery and put on in aid also of Jeans4Justice. Zandra Rhodes - a Lifelong Love Affair with Textiles at the Mingei International Museum in Balboa Park until April, 2011.
. www.ArtMeetsFashion.org is our dedicated website and your details will be included on the FRINGE online calendar linked to the SDVAN website We are planning press releases and a number of other collateral events to create a great deal of excitement about the Art Meets Fashion promotion. The only requirement of participation is your listing in the SDVAN directory if you have not already done so. This listing is free. All we ask in return is that you put a link to www.ArtMeetsFashion.org on your webpage promotion for your event. An AMF: The Fringe Events logo is available by request. If you are interested, please make your normal event listing on the SDVAN calendar. Please pass on the title and dates that the event starts with a note that you want to be included in Art Meets Fashion: The Fringe Events. Your listing on SDVAN should include the following. Correct spelling of your venue name including contact details address, website url, and telephone number with contact name. Details of all participants including name and urls if available. Brief description of the event and how it ties into the Art Meets Fashion theme. Dates you are prepared to have the events including opening reception if any. The event can start before May 2010 and/or end after June 2011 if you chose. Kim Richards - PR Liaison. Krystel Tien - Fashion Show coordinator with help from Loren Smith Productions. Celia Durand a member of Digital Art Guild, help with software issues. Robin Koltenuk and Deanna Sabeck who volunteered for our first information meeting and were so helpful. Joy Paje who volunteered at our celebration launch meeting July 21, 2010 at the Microsoft Store in Mission Valley. Our gratitude to Alan Zitter from the NTC Foundation for hosting the public launch of AMF. Continuing thanks to Brian Willis and Zhibit.org for their sponsorship of the online competition for AMF and for offering free website to artists. Kelly Fleischmann at the The Younger Agency. Adam Levins and Jessica Mandeville deserve our thanks for creating our short promotional video. Ruth Holden and their merchandising students for help with the display at the SD Airport. Special thanks to Andrea Lattanner who helped arrange for us to use the Microsoft Store in Mission Valley for our Participants celebration event..
Special thanks to Jenn Goodrum and Popchips for their in-kind donation. Carolann Dekker gives generously in sponsorship support and deserve our special thanks. Special thanks to Marie Abordo and Glaceau Vitamin Water Zero for their in-kind donation. The San Diego Visual Arts Network (non-profit Public Charity 501 (c) 3 EIN #205910283) has a mission to improve the clarity, accuracy and sophistication of disclosure about San Diego's artistic and cultural life. We are dedicated to reinforcing the idea that the visual arts are a necessary and vital part of the health of our city. By providing a website with a directory and events calendar and facilitating numerous collaborations on visual arts projects, we hope to not only build the confidence of those involved in the arts, but disseminate information throughout San Diego thus raising the bar on the writing, production and appreciation of the visual arts in our region. SDVAN list 1600 visual arts resources, has 4,000-5,000 unique visitors to our website per month and get over one million hits a year. We have approx 3500 on our opt-in mailing list. SDVAN exhibition resume includes: Little & Large, Movers and Shakers, SD Art Prize, New Contemporaries. FOCUS (Fashion Opportunities Connect US) is a fashion industry networking organization for emerging professionals. San Diego International Airport Art Program provides enhanced customer service by exhibiting artwork and presenting programs that engage travelers in innovative, memorable and considerate experiences. It creates an ambiance unique to San Diego and welcomes approximately one million people monthly to the airport and to the region. The primary purpose of the program is to present work from individual artists and cultural institutions that promotes cultural tourism through the presentation of visual and performing arts.